Alejandro Villamar to the left from RMALC, Mexican Network against Free Trade that have signed the letter from Latin American organization below. 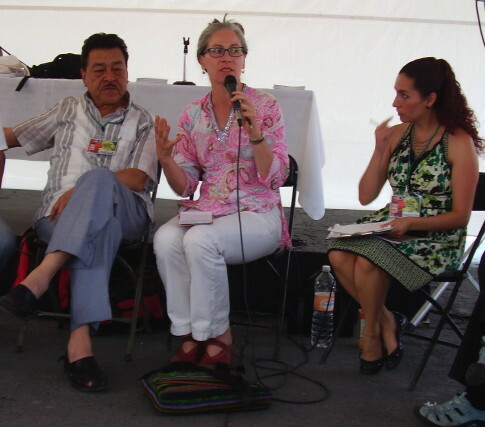 In the middle Nicola Bullard from CJN at the discussion on Cancun at Foro Social Mundial tematico in Mexico City before the letter was sent. The Hemispheric Social Alliance, Jubilee South/Americas, CLOC-Via Campesina, Friends of the Earth (Latin America and the Caribbean), REBRIP, COMPA, Jubilee South/Americas, Andean Coordinator of Indigenous Organizations (CAOI), Brazilian Network for the Integration of Peoples, the World March of Women and the Mexican Network against Free Trade and CADTM Abya Yala are committed to work together in the construction of a process of joint mobilization around the problem of climate change, its structural causes and true solutions. We have identified several key points in the coming months including the Enlazando Alternatives Summit, the Americas Social Forum in Paraguay and COP16 in Cancun. Since the theme of COP 16 is climate change, it is especially strategic for the worldwide climate justice movement. As stated in the letter from the Assembly of Social Movements, held during the World Peoples Conference on Climate Change in Cochabamba: “We consider that the question of climate change is important, together with other manifestations of systemic global crisis. To truly confront the imperialist offensive we must stop; the militarization of our territories, the criminalization of social movements, the entire neo-colonial agenda contained in the Free Trade Agreements, illegitimate indebtedness, the power of transnational’s and especially the agro-business and extractive model which promotes the privatization of life and nature”. During the Cochabamba conference, we discussed and advanced in the consolidation of alliances to build a process of mobilization for Cancun which is sufficiently solid to have subsequent continuity. In this respect, the importance of building on pervious experiences such as the struggle against the FTAA, which enabled us to identify points of convergence and common struggles among the social movements of the continent opposed to this economic and social model. These struggles are made known in many different ways including via Peoples’ Summits, which are moments of resistance, debate, collective construction and mobilization. These Summits are a tradition for the movements of the entire hemisphere and have earned legitimacy as spaces for struggle in the face of a plethora of neo-liberal initiatives against the peoples. As a result, in the face of COP 16 in Cancun, we believe that it is crucial to strengthen the continental process, coordinating the efforts with networks and organizations from other regions of the world, as we have done in the past. While we respect and value the experience of the Kilmaforum, it responds to the European and more specifically, Danish context. An attempt to transfer or import it to our region would not respect the reality of our struggles, the identity or history of the mobilizations in our hemisphere. We recognize the importance of joint actions with other regions, especially related to this theme, in light of the implications that affect the all of the peoples of the world. In keeping with the spirit of agreements reached in Cochabamba, the priority is to strengthen ourselves and link eforts with the campaigns, networks, regional and global organizations that have worked in recent years to confront climate change and defend the rights of Mother Earth, as well as other regional and global sector networks and thematic organizations which have made the same commitment. Many of our networks and movements are working at a global level. In this respect, we believe that the convocation and mobilizations in Copenhagen were very important and it is necessary to continue the alliances that were consolidated there, and emerged from previous processes. However, this must not ignore national and regional processes. In relation to the work that is happening in Mexico, we think it is important to make a few observations: there are a number of social organizations around the country which are working to consolidate a broad space of convergence and mobilization. This work is the result of a call which went out among interested groups (including RMALC, the Mexican organizations which are a part of the “Drawing the line for Change” campaign, Other Worlds, organizations from all social sectors including members of Via Campesina and some NGOs which are a part of this struggle). Given that the goal is the broadest possible coalition, based in the work of the social organizations; it is a process which requires time. Activities that provide information, formation and discussion must be carried out in order to construct popular consensus around our demands for climate justice. We support this process from a regional level and we believe that the space being developed in preparation for COP16 must be broad, have a political character and be oriented towards mobilization, where a debate can be held with networks and social organizations at a global level, to raise our voices in rejection of the economic model and to demand climate justice.